The projected beam from the collimator should overfill the entrance pupil of the imager under test. Obviously, the clear aperture of the collimator must be larger than the entrance pupil of the system under test. Since electro-optical testing involves projecting an extended target area, the useful clear aperture of the collimator is decreased by the largest dimension of the target due to vignetting. For example, a collimator with a 250 mm clear aperture used with a square target featuring a 50 mm diagonal will yield a useful, unvignetted clear aperture of only 200 mm. Therefore,when specifying a collimator one needs to consider both the entrance pupil of the imager under test and the target size of the source to be used within the testing system. The collimator and point source combination project a test target at a particular subtended angle depending on the focal length of the collimator. This subtended angle should be no bigger than 110 the instantaneous field-of-view (IFOV) of an imaging system. The IFOV for a digital camera is defined as the pixel size over the focal length of the camera lens. This condition can be relaxed for testing electro-optical systems that exhibit only moderate performance. Reflective collimators are recommended for performing polychromatic measurements over extended wavelength ranges. Each collimator is an off-axis paraboloidal mirror with 8 surface accuracy and an enhanced aluminum reflective coating. Other coatings can be supplied upon request. Each includes a kinematic mount, a reference flat mirror, a fixed height source riser assembly, and an optical path fold mirror assembly. 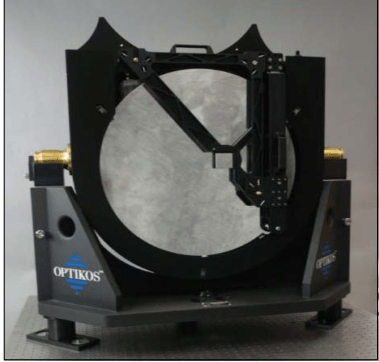 Note: Collimators for electro-optical test systems feature a 500 mm optical axis height.